I am a long time Adobe customer, with a long list of products I've purchased. I am now having trouble accessing user forums. Whenever I go to forums.adobe.com I get "System Error: We're sorry but a serious error has occurred in the system." If I am using a browser that has my ID, I get that error immediately. If I clear cache and cookies I get the Forums login prompt, but once I log in with my long time user ID I get that same error. I have discovered that I can access the user forums if I create a new ID. But whenever I try to use my old ID, I get this same System Error. The old ID works fine on adobe.com -- I can see my account, list licenses I own, etc. I prefer to keep my old ID as it has my history of product licenses. Can someone at Adobe look into this problem? Are you still encountering this error? Looking into it now. Sounds like a specific issue your Adobe ID email. Should be fixed now. Can you try now? Works now! Thanks so much for your prompt action. Anytime. Glad that fixed it! I'm having this same problem and cannot seem to fix it. I would appreciate any help or advice. A whole bunch of us have had this occur from time to time over the past few days. I think they're working on it. You might want to delete your cache in case your browser is using that instead of going in fresh. If you're not able to get in to the adobe forums very soon, then speak up again. As you can see from my post from a year or more ago, clearing cache and cookies did not help me. It was only when someone from Adobe reset something at their end that it started working for me. You need to somehow get the attention of someone from Adobe support. I know it might not help. I don't know if this is the same issue. A number of us have been reporting this over the past few days. I haven't had a problem since probably Wednesday (and didn't clear cache or contact Adobe support about it), others mentioned it Thursday, while I know someone else asked me if I was having a problem just this afternoon. Whatever is going on appears to be intermittent. I know some people at Adobe are aware of this. I don't know how much support will be on hand over their week off this week. I had the same error message this morning using FireFox browser. Internet Explorer works so I tried clearing the FireFox cache and that fixed the issue. If you need help tell us what browser you're using. Well it's back! Clearing FireFox cache again did not remove the System Error message. But Internet Explorer 11 still works with no issues! And I've got Firefox and just got in, no problems since Wednesday, I think. I think we just wait until whoever is responsible for fixing it gets around to fixing it. Not too likely over a holiday period, especially if it's intermittent. I have contacted Adobe support about this. Their online support is very bad, barely understood what I asked for. They did not know who manages the forums, and accused me of having a bad machine. I tries to log in using 3 different PCs and 3 different Operationg systems. There is no problem with myc machines. This is something with the account. When i creat a new account i can use the forums. Unbelievable. I can send the transcript to anyone interrested. Clearing out the Cookies + Cache seems to have fixed it. Using this method I could logon using my Windows machine. Then all of a suddenly i could also log in using my OSX Mac on Safari which displayed the same message..... without doing anything. Unless of course someone heard me and did something without telling. Because this just does not make sense. really strange I hope Clearing Cookies+Cache works for everyone. Besides clearing out cache and cookies, folks should find they can get around the problem at least temporarily using their browser's menu to have it create a "new private window" (FireFox), "new incognito WIndow" (Chrome), "new session" (IE), or the like. These open a new window that does NOT send the same cookies that were being sent in the other window (which was failing). The cookies being used in your original window are somehow the problem (that the Adobe site is not liking, perhaps even only temporarily). I just wanted to point out the "new private/incognito window" as an option since no one else had. It worked for me, to at least let me get into my desired forum. As others have noted, the problem only came up recently, so it may go away (in my other window), and I may not need to bother deleting cookies for the forum site after all. Hope it may help someone else at least temporarily get in. Let me add a clarification, before anyone else may be tempted to contend with a point I made. I said, "As others have noted, the problem only came up recently, so it may go away (in my other window), and I may not need to bother deleting cookies for the forum site after all." What I meant was that it had only come up recently *for me*, as in the page I was looking at yesterday in the browser failed with this error when I refreshed that forum post I was looking at. I will add that I also created a blog post on this topic, where perhaps some other comments may appear from others not seeing this thread. And I would share there anything I learned here. Guess what...I am having the same issue and have had for months. I've cleaned my cache and cookies in the past, several times, but to no avail. Seems like it's a technical issue on Adobe's end. Can someone there lend a hand or a tweak? BTW Going Incognito got me into the forums! Thank you, Charlie! FWIW, I will report that the page I couldn't get into last week (see my blog post) suddenly now "worked". No explanation (and I don't expect it's related at all to the post). Sometimes it seems like some of my files suddenly get snakebit. And that makes me have to recreate them, page by page. Such a terrible waste of time. Sharon, in referring you "files" you "create", are you referring to things you may create with Photoshop? If so, it would seem that would have nothing at all to do with these problems we've been discussing here. But if you mean files you save in the Adobe cloud, well, I suppose there COULD be a connection between this problem (of forum access) and such file access...but even then I would think it would not be that the files (that you create in the Adobe cloud) are hurt, but instead it could be just like we have experienced here, that you just couldn't get to them. This is happening to me - it's a catch-22 -- who do we contact if we can't log in to the forums? Tried Edge, Chrome, clearing cache/cookies and even incognito. All yield the same result mentioned in this thread. I'm very surprised to hear that the incognito approach did not work. If you would say this has been happening for hours or longer (whether days or weeks even), in which case we can assume it's not some general problem but one unique to you, then I'd think your best best is to report the problem and seek help on the Adobe forums themselves. Can you try that and let us know if you can get in? If not, then note that your failure is probably happening based on your login. You could (if you were sufficiently motivated) create a NEW account, even if JUST for this one problem. Then you could use that to file this report, get your help, then get back to using your old account. Hope that helps. I'm just a fellow user of the Adobe forums. Raising the concern here is not going to get it in front of the right people at Adobe. That forum (about the forums) definitely will. Hope you'll write back to let us know how it goes, or if you will choose not to bother. If you do, perhaps you could offer a link here to the forum post so others could follow along. Thanks for the help. 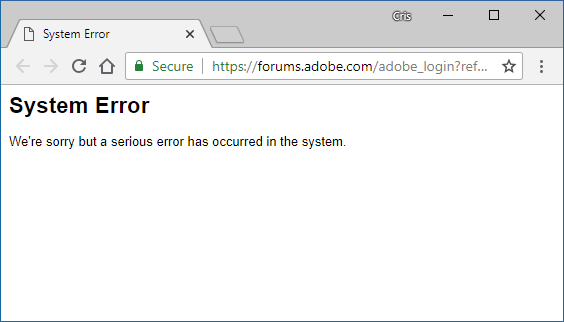 Indeed, clicking any link starting with forums.adobe.com leads to the same system error page. Given that lots of people commented here (and an admin even fixed it for someone at the top), I thought I'd try. Also, given that lots of people commented here, I would have suspected that Adobe would have at the very least made a system error with more useful information (or a person to contact). But clearly the problem is not happening to everyone. As has been made clear throughout all the messages above, this is a problem that happens to only SOME people for SOME time. So I hear you feeling that you are resigned and unable to proceed in any way, because ANY attempt to visit ANY Adobe forums page fails for you. I will say again that I will find it VERY hard to believe that if you visit the site from some browser's incognito page (where no cookies are being sent) or some browser where you've never visited the site before (whether one you may install today, on your computer or phone, or that of a colleague) that you won't be able to get into that forum about the forums, and write up your concern. Again, lamenting here that Adobe ought to do something won't get you a solution. Please tell us if you'll be motivated to go that extras step to try some OTHER browser which you've never used before. And then again let us know if you create a forum thread there to discuss this. Haha, I just spent 40 minutes on Adobe chat and got absolutely nowhere. I feel sorry since the person tried really hard to research the problem (probably googling like me). I don't recommend anyone to try that route! It's a waste of time. EDIT: I have tried two systems (one at home and one at work), different browsers, clearing caches, logging in first to adobe.com (which works just fine), etc. I created a new account. I did find a comment at https://forums.adobe.com/thread/2351903?start=40&tstart=0 that resonated to my experience. Like jacobb10043768 I also had one post that was moderated (the reason was never given as to why, but I suspected it was because I posted a link that was outside of Adobe's sites?). After the moderation occurred is when I started to have problems. I don't believe my account was banned (the customer support chat person didn't say anything was wrong, and I used my adobe.com account to access chat). At the time, my edited post (the one without the links) made it to the forum. Anyway, easiest solution is to create a new account! Well, yeah. Creating a new account certainly would be AN ANSWER. I don't propose it as THE answer to this because some people would want to be able to maintain the history and connection they have with past posts they'd either created or contributed to. But sure, I proposed creating a new one just to allow you to proceed with getting past the login issue, to report the problem then in the forum about the forums. So that's interesting to hear that you may have found a connection with the inability to login and some sort of moderation due to a previous post. It doesn't sound like it SHOULD happen, I agree. But in terms of problem-solving, it's helpful to note there may be some connection. Anyway, I also would NOT have proposed reaching out to Adobe support. Just keep in mind that they server millions of customers about hundreds of products--and getting help from those support folks about such a relatively rare forums problem would not seem likely. That's why I proposed writing instead to the forum about the forums--those ARE staffed by people (Adobe reps and volunteers) focused SPECIFICALLY on forums issues. Anyway, it sounds like you're satisfied with just creating a new account and moving on. Again I offer all the rest for anyone who hits this in the future and wants to try another tack.